Nothing beats a warm shower in the morning or after a long day. However, while the warm water works miracles on your nerves, it has a damaging impact on your bathroom. Excess humidity level settles on your bathroom surface, causing damages in the manner of warped cabinetry, peeling wallpaper, and cracked paint. Furthermore, excess moisture leads to the development of mold which threatens your indoor air quality. To prevent this, you need the best bathroom fan for your bathroom. It will remove the excess humidity and moisture from your bathroom and save it from damages. The best fan will also remove odors, mirror fog, and protect your family from mold related issues. The Size of Your Bathroom – Bathroom fans come with their unique CFM ratings. So, measure your bathroom to determine the ideal fan for its size. Sone – Check the sone rating before your buy your fan. The lower the sone, the quitter the unit. Energy rating – You should get a unit that uses minimal power. Size – You don’t want to install a bathroom fan that will take much space in your limited space room. 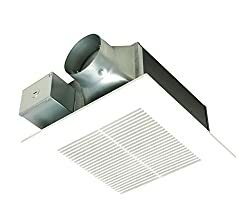 Installation options – You can buy a bathroom fan that you can install on the wall or the one that you can hang from the ceiling. Durability – Just like any other gadget you would buy, ensure that your fan lasts long. Budget – Consider you budget before you hit the market to look for the right unit for your home. Warranty – Your fan should have a long term warranty to cover any mechanical or manufacturer defects. Lights – Some units come with light sockets or lights built into their body. This ensures that you fit a light bulb to your fan to have additional light in your room. Heater – Other units are able to warm your room. They come with a heater. Bluetooth – These are the latest types of bathroom fans to hit the market. They allow you to enjoy your music while taking your shower. Ensure that you bathroom fan serves the purpose you bought it for. Now let’s look at the top 7 bathroom fans on the market today. The Panasonic FV-80-11VF5 ceiling mount fan features a SmartAction Motion Sensor and is perfect for renovation, remodeling, and new constructions. It comes with an installed pick-A-flow speed button that enables you to choose the required airflow. The low profile 5-5/8 inches covering depth fits in a 2 by 6 construction. Furthermore, you can use this fan to conform to the latest standards and codes. The unit delivers quiet operation and is energy efficient. And because the fan is long lasting, this might be the last fan you purchase for your bathroom. Designed for bathroom duties, the Broan 678 ceiling mount fan with light removes humid air, stale, and brightens your bathroom. The product comes in a variety of shapes and sizes, so you can be assured of getting the ideal one for your home. By eliminating moisture and removing odors, the fan improves you bathroom’s air quality while decreasing the humidity levels. The unit is pretty powerful and dependable, thanks to its efficient polymeric fan impeller and plug-in motor. It is also very easy to install this fan and it is ideal for small bathroom. 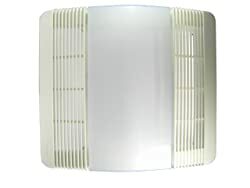 Broan has led the industry with innovative bathroom fans since 1932 and one of its best units is the Broan 688. This unit is quite convenient and meets the desires of every homeowner as well as designers alike. 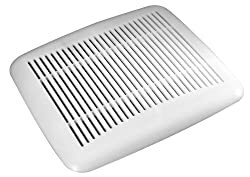 Also, this is a revolutionary product that enhances your bathroom environment by eliminating odors and reducing the level of humidity. 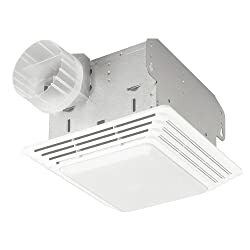 It is also very easy to install, both on the wall or ceiling and outperforms most fans in its class. The unit is also very affordable and was designed to last for decades. The Delta SLM70 is a compact-sized fan that doesn’t produce a lot of noise when cleaning your bathroom’s air. The unit has a valued price Energy Star that shows you just how efficient it can be and is ideal for large multifamily projects. The best part, you can install it both on the wall or ceiling easily. It fits inside a 4 inches wall and has a DC brushless motor for low power consumption and extended reliability. The unit combines different design innovations, such as switching power supply, to assure you of getting a unique product. The NuTone 665RP fan comes in a compact 2 x 6 inches construction. It also features light lens snaps off and on for faster lamp replacement. Also, the unit is completely sealed to ensure that it is safe for use in your bathroom. Furthermore, the unit comes with 4-way adjustable hangar mounting clips and bars that help with fast installation. The unit is also very affordable; you don’t need to break a bank to get it. It also lasts for years to guarantee you that you don’t hit the market any time soon. You do not need to heat your whole house to have an ideal bathroom when you wake up. In fact, it doesn’t make sense to wait for the central heating system to heat your bathroom while you can do so with Broan 655. 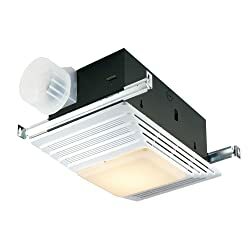 This light, heater, and fan provide powerful light, heating, and ventilation at a press of a button. Light, fan, and heater bring comforting warmth and convenient to your bathroom. It is made with white polymeric grilles that complement almost all decors. And the best part, the heater, fan, and light are all independently controlled. The Panasonic FV-11VHL2 adds a little warmth to your bathroom during the cold days since it comes equipped with a heater. It also adds some light to your bathroom while cleaning the air to provide comfort. It is whisper quiet when operating due to its latest fans that are enclosed; you might not notice it is one. It also uses a bigger blower wheel that cleans a large amount of air at a go. The fan is designed to provide you continuous, hassle-free operation for decades, thanks to its permanently lubricated motors and high-quality components. This Genuine NuTone grille and lens assembly include the grille and lens. This is one of the best replacements on the market today and fits all NuTone/Broan ventilation fan and heaters models. In fact, it fits VF707RCN, VF705RCN, VF307CN, VF305CN, V769RF, 770F, 769RFT, 769RF, 769RLN, 769RL, 763RLN, 763RL, 669FN, 669LN, 669L, 663LN, 663L, 663FL, 663N, and 663. However, if you own a 669 or 663 series fan, this might not be the ideal replacement for your fan. Most of the original design grille’s came with springs. This replacement cover doesn’t attach to the springs. It has a reflector. This replacement cover is able to attach to the 669 and 663 series fan since it attaches to their springs effectively. It also features some grille and is one of the best seller covers on the shelves today. 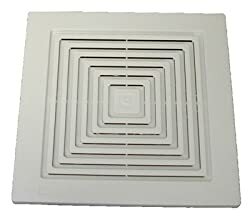 Measuring 9 by 9-1/4 inches, this cover fits most bathroom fans and it is very affordable. That’s not all since it guarantees you years of services. You will also be excited to learn that it is made of durable material. 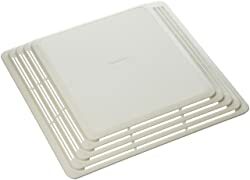 This NuTone replacement cover fits Broan 684 and Broan 676 and measures 10-5/8 by 11-1/8 inches. It comes in handy to replace damaged covers to ensure that you fan is well covered when operating. The cover reduces the noise of your fan since it completely covers it and will last for years. It is also very easy to install and once in place, it requires little maintenance. This kit enables you to turn your old bath fan into a brand new air purifier in just 5 minutes. It improves your unit’s performance, upgrades its appearance, and reduces the amount of noise it produces. Actually, it reduces the noise by about 50% while improving the air condition by up to 20%. It also helps to control the humidity levels that cause mildew and mold. What is even interesting is that you don’t require any tool to install it. It comes with everything that you will require. It is also very affordable. Once you have purchased the right fan for your bathroom, all that is left now is to install it. This is a task that you should leave to an expert unless you are a seasoned DIY person with installation skills. Your fan is placed in the right place – usually near or over fixtures or the middle of the ceiling, far away from any opening. Controls are convenient and effective – unless it has a delay-timer, your fan should have separate buttons for fans, lights, heaters, since it is recommended it run for about 20 minutes after taking a shower. It is vented outside your house – not to your attic or any other place. A roof or wall vent cap should also be installed to keep your house sealed when the fan is off. Here are a few tips for using your bathroom fan. If you own a steam shower, you should have a separate fan that can be timed so that it can run after every shower and shut off when taking your shower. This will ensure that your shower is always dry. Do not run your fan any longer than required. While this unit is running, it is taking moisture and air to the outside. With that said, whatever it blows out, it can somehow return to your house if you fan runs for long. Run it for about 20 minutes. 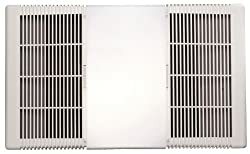 Here are a few questions that are often asked about bathroom fan. Q: What is a sone? How is it determined or measured? A sone is simply a measure of sound level in terms of the ideal hearing level for a normal listener. A lower sone provides more comfort to the listener and the surrounding environment. A sone is not volume or decibel, but how you sense the sound. Q: What is the meaning of CFM? CFM stands for Cubic Feet per Minute. It is the measure of air that is moved by your fan blower in terms of volume. 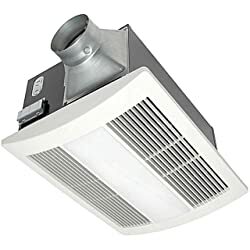 You should get a fan with the right CFM rating according to your bathroom size. Q: What does continuous ventilation mean? This provides controlled and constant lower level of air movement. Some fans are well suited for this application. Your bathroom is one of the most important rooms in your home; maybe second to the kitchen. Protecting it from the damaging effects of humidity and odors can be achieved with the best bathroom fan. 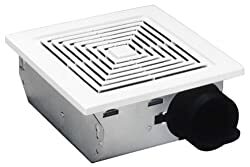 However, knowing “what is best bathroom fan” can be a challenging task but since you now know where to start, we believe you will have an easy time. 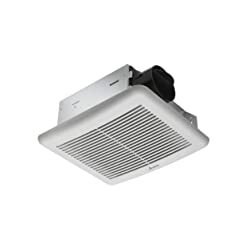 Just as a start, you can try the Panasonic FV-80-11VF5 WhisperFitEZ Fan 80 or 110 CFM. It is very effective and offers value for money.